Photo courtesy of Mary Poa. Shredded Children are the GRATEst ones. After Communist China takes over Hong Kong, people start eating children. Fried Ramen is made from very young soylent green! One Kung Pao Children please. – Childburger with French Parents, please. Still tastes better than shredded wheat. They also have bratwurst made from real brats. That’ll teach them to say “Bite me” ! I can see why they abolished the one-child-per-couple policy. “Children Fried Ramen” is a guitar solo? We love children, yes we do, shredded or boiled in a stew! Children are to be shredded, not to be heard. They misunderstood when they were told they needed a kids’ menu. Having children is easy. Bringing them up can be awful. OH! I thought the menu said “Children’s Meals”. I love children….But I could never eat an whole one. Raising children is so so. It’s harvesting them that is fun. Hansel with a side of Gretel please. Reminds me of the song about the kid who wanted to be an Oscar Mayer wiener. His wish came true after an accident during a field trip to a meat packing plant. I wonder if Harrison Chase had a child shredder in his basement, in addition to his adult shredder. 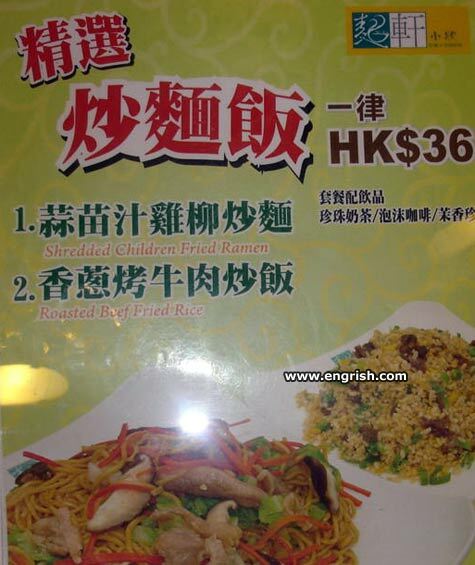 I think I’ll just stick to KFC – Kentucky Fried Children. The children are our future … lunch. We are the world. We eat the children.. … and its time to lend a hand to shred. The greatest gift of all. I’m feeling a bit bloated. I’ve got to go channel my inner child. While on a hike, the diner passed his children in the woods. Whenever the kids get behind in their chores, we like to take out this menu. Shredding them’s not that difficult, it’s getting ’em into the damn shredder that’s hard. The shredded children are guaranteed flesh – or your money back. On top of that the ramen are also fried with pure, natural children eggs too. The witch from “The Far Side” cartoon has been at it again!